What Could Single-Payer Health Care Do To Your Hospital? 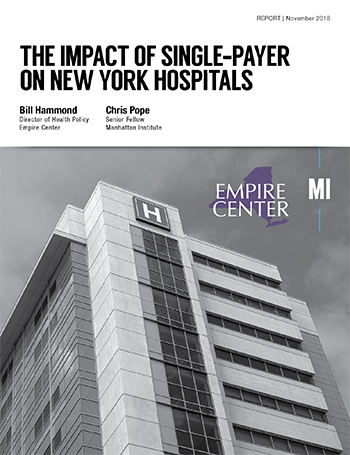 As part of a new report by the Manhattan Institute and the Empire Center, authors Chris Pope and Bill Hammond looked at the effects of a single-payer system on New York’s hospitals. Under such a system, private insurance would be eliminated, meaning hospitals would be entirely reimbursed by the government. Any such system would dramatically redistribute funding among hospitals, dividing the industry into winners and losers. Assuming the new plan paid at the same level as Medicare, the report finds that 77% of hospitals would lose money. 4 in 10 would face revenue losses of 15% or more, putting them at risk of service cutbacks or closure. Alternatively, if fees were set 20% above Medicare rates – keeping overall spending at current levels – two-thirds of hospitals would gain at least some revenue. However, higher reimbursement rates would mean even steeper tax hikes, especially as costs grow over time. Additionally, one in eight would still face losses of 15% or more, including such flagship institutions as NYU Langone and the Hospital for Special Surgery. *Estimated change in revenue under a single-payer system that applies current Medicare reimbursement levels to all patients.